As you have likely noticed, there a plenty of things on the CVOs that are just plain ugly and not fitting of these bikes. Cad plated bolts and ugly black zip ties to name a couple. I hated those two on the left front downtube holding that ugly black wire that runs from under the tank to the voltage regulator. 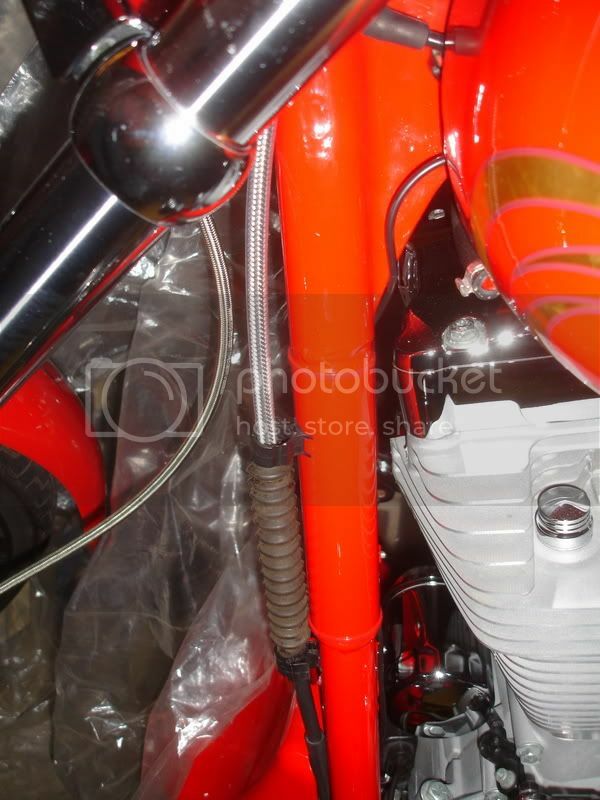 I heard of chrome zip ties then found bright red ones that reasonably closely matches the red paint of the FXDWG2. I was able to make the zip ties all but "disappear" and rotate that heavy wire back around the leg so it is hardly noticeable. Then on the frame downtube below the seat are two more ties that I replaced with the red ones for a nice simple clean up to the look. Now if I can get rid of that ugly black clutch adjustment boot and the two black clips that hold the cable to the frame...wonder if I could get those clips "plastic chromed"? Couldn't agree more with your assessment of some of the chincy pieces HD uses to finish off these great bikes. I too hated the cable routing setup on the WG2. Finally found a workable solution when I switched out the cables to nicer chrome models and utilized the Cable clamp from the 09 Fat Bob (the top portion of the WG2 downtube is thicker than the lower and HD didn't make a clamp with enough circumference until last year). I just clipped off those ugly black cable holders and tidied it up the electrical cable routing with some chrome zip ties. Attached a nice big photo so you can see the detail. You're on your way to a nicer looking setup. Mod on! Put up some other photos of your scoot. Always enjoy seeing what others have done to their Switchblades!